From new doors to urgent repairs, we're the team for the job! Each and every garage door requires a little bit of lubrication maintenance. It is an important part of the care provided to the system and helps to ensure a smooth, effective and quiet operation. At the same time, there is still regular confusion about the parts which have to be lubricated for the system to work properly. Read on for information and advice from our experts to make sure you're doing things right! Which Parts Should Be Lubricated? As a rule of thumb, the moving metal components of the system or some of their parts have to be lubricated. This is because when they move, friction is created, speeding up the natural process of wear and tear. This can also cause the door to become noisy. Over time, unimpeded wear and tear as a result of a lack of lubrication can lead to more serious damage. Lubricant should also be applied to systems using a chain drive powered opener. This will prevent the chain from succumbing to rust and seizing up. The cables that lift your door require slight lubrication at the bottom bracket button. The same applies to the bearings of the sheaves. The lubricant has to be applied to the rollers too - when they get too dry, they can make squeaky sounds which can be particularly annoying. It is important to note that nylon rollers shouldn't be lubricated because the products used for this purpose may actually cause damage to the nylon wheels. Now that you know which garage door parts to get lubricated, you'll want to ensure you're applying it properly. Firstly, you'll need the right product. It must comply with the requirements and recommendations of the manufacturer of the door. Keep in mind though, that you may have to use a different product for the opener. The parts should be cleaned before any lubricant is applied - you may also want to consider a rust removal treatment too if you notice components are corroding. For cleaning, you can use a citrus-based solvent or another type of product recommended by the door's manufacturer. You'll need to apply small amounts of the lubricant to the different parts of the system and gently spread gently with the use of a brush or a cloth. Make sure that you cover the entire surface. With proper lubrication, you can extend the useful life of all metal parts including the garage door tracks and hinges - it's a no-brainer! If you've got further questions regarding this, just get in touch with our experts in Denton, Texas for further advice and assistance! We're a team of highly skilled garage door repair specialists in do more than carry out spring replacements and offer emergency services. We also specialize in installing new openers and doors, and we'll be happy to provide you the guidance and consultation you need to make an informed decision. Use our online system to book an appointment. When you hire Garage Door Repair Denton, you get the best service, the best products and the best results on every call! Our technician will contact you before arriving. Until then, feel free to browse our website! 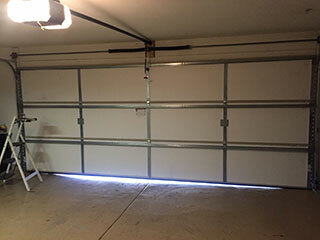 Garage Door Repair Denton is at your service!